Today, I will share that story with you through an islander’s lens and maybe, just maybe, my story will paint a different picture of climate change, one that you may not have heard before, one that you can relate to because it is not a scientific prediction, but based on actual events. difficult and sensitive waters to navigate. Therefore, I will not attempt to dispute any of these views. Today, I only wish to raise a civil inquiry because I have witnessed too much and my empathy demands that I be concerned and speak out. For the past 10 years, I have seen so many changes on our island, not only in the climate, but also that the size of our already tiny island is getting smaller. I am from a small island in the Federated States of Micronesia called Kosrae. It is located 1,360 miles southeast of Guam. Kosrae is a 42 square mile single island of lush, green and tropical trees. It is home to approximately 7,000 of the friendliest people you will ever meet. Kosrae is part of the Federated States of Micronesia, a country that has had close ties with the United States since 1947, when it was formerly known as a Trust Territory of the Pacific Islands. Today, we are a sovereign country that continues to enjoy close diplomatic relations with the U.S., which I will forever be grateful for. We are people with little material wealth, but we are deeply rooted in our values, culture, families, and untouched natural resources. These to us are priceless. Amongst these natural resources is the pristine, blue water that stretches out for miles into the horizon and wraps around our island. If there is one thing we are known for, it is that we, Pacific Peoples, are voyagers and that this pristine, vast, blue water unites us all. It is a beauty that is so dear to our hearts, one that we never thought would one day become a threat to our survival, a threat to our rights to live in and enjoy our islands. My father, Sankey, is 61 years old today. He used to tell me stories of how the sandy beaches used to stretch so far out that they could play mini baseball–baseball played with bats made of short old tree branches and a tennis ball, on the beach. Fast forward to 30 plus years later, I played on those same beaches. While they no longer stretched out far enough for us to enjoy a game of mini baseball, 10 yards was still enough for families to come together, play beach volleyball, grill, and watch the kids play and swim. Today, if we are lucky, during low tides we see sand in few locations. 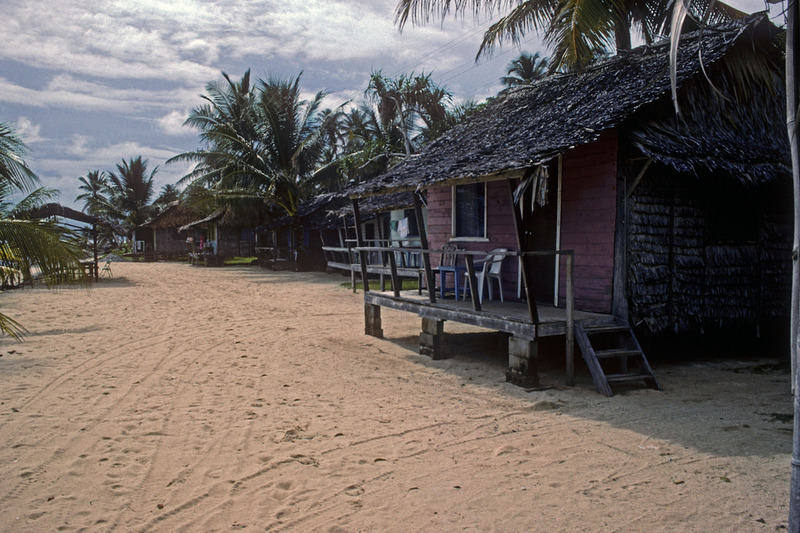 High Tides at Tafunsak, Dec’-99. Photo courtesy of Kosrae Environmental Agency. So while the American public is divided on this issue, we islanders know what we see. I do not need science to tell me the ocean levels have risen, as I have watched our sands repeatedly devoured by high tides due to sea level rise. 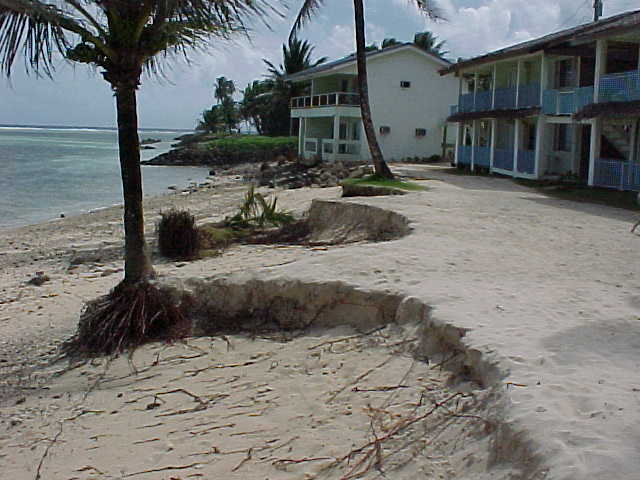 I do not need science to predict that seawater will one day destroy our homes as many houses along the coastlines have already been destroyed. I do not need science to predict the impacts of climate change on our way of life as I have witnessed farmers lose their crops, their only source of food and income, because salt water has inundated the groundwater and destroyed them. The Pacific Island countries are developing countries. Governments and stakeholders are consistently challenged in their duty to diligently serve and provide for their people while simultaneously battling this cross-cutting issue of climate change that is threatening our livelihood and existence. This is an uphill battle for us because we are small and have little influence and power in the international community. However, when we continue to share our stories, we move people, people like you, like the SanDiego350 people I’ve met, and the great state of California, where I currently live. As a Christian, I will not ask why things are the way they are. The only “why” I am asking, and that I ask you to ask is: “Why should we not respect and take care of this home we are given?” Is it not our duty to protect this planet so our kids can inherit a safer and cleaner place to call home? As a Christian, a mother of 3 beautiful daughters, a concerned Pacific Islander and global citizen, I can’t stand idle knowing others are suffering. I will hope and pray. At the same time I will fight for a cause that may increase my daughters’ chances of returning home and enjoying Kosrae. This was first posted at our associated San Diego Free Press. Newer Article: Reader’s Rant: Will New “Smart” Led Street Lights on Newport Ave in Ocean Beach Write You a Parking Ticket?